Our beautiful Snow moon was 99 .9 % drenched in the suns light when I went observing on the last day in February 2010. 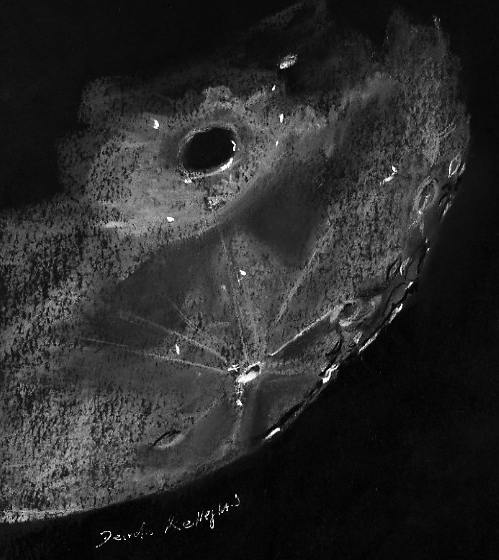 Along the NW limb several craters were on view in the libration zone, it was my intention to make a sketch of these elusive features. They presented on the limb as dark deep long shadows edged with sharp bright lines against the blackness of space. However while these were interesting, my eye was magnetized toward the brightness of Goldschmidt and its ejecta rays, giving great form to the area. Several of these long dark lines were also on view on the edge of the limb close to Goldschmidt and Herschel . It was so visually interesting to observe the contrasts on the limb when the moon was so full, a black and white merry dance of slow movement and rich structure. Beautiful sketching. It is so very nice to see one of your brilliant sketches here again. I feel this is sketching at its best. It conveys much energy. I can only endorse what our fellow sketchers have already said above, to add to the “Energy” that Frank noted, it conveys great Lunar passion.